New! The Kiddiewinkles Bedding Set (from £30) will give any child’s room the ‘wow’ factor! You can choose between cot bed and single bed size, with both options including a duvet cover and Oxford style pillowcase. One side of the duvet cover features an ‘all over’ star design, while the other side is plain white with star design detail adding a finishing touch, giving you two looks for the price of one. The 200 thread count cotton percale fabric is hard-wearing, long lasting and washes well, so your little ones can enjoy the luxury they deserve when snuggled up in bed! 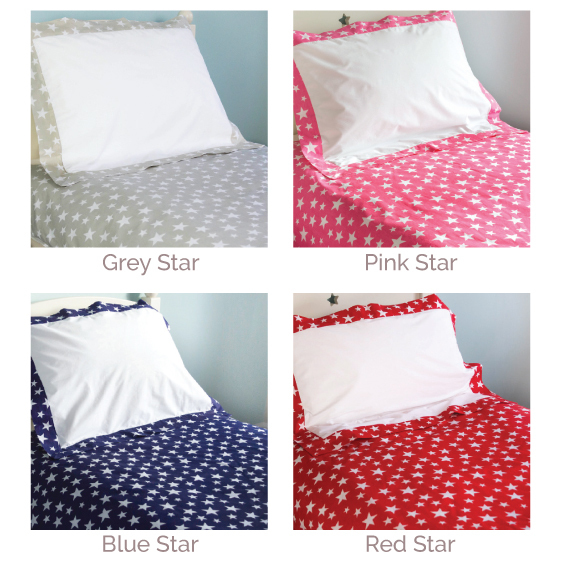 Choose from grey, blue, red or pink, with personalisation available.